Journalism assignments and dissertations use the APA Referencing format. 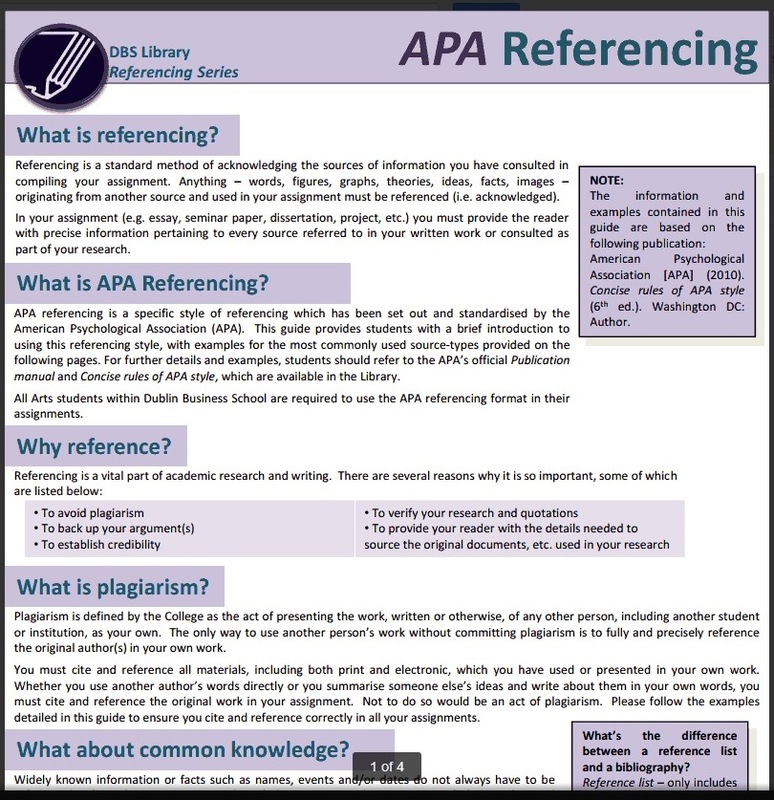 APA referencing is a specific style of referencing which has been set out and standardised by the American Psychological Association (APA). This guide provides students with a brief introduction to using this referencing style, with examples for the most commonly used source-types provided on the following pages. For further details and examples, students should refer to the APA’s Official Publication Manual and Concise Rules of APA Style, which are available in the Library. All Arts students within Dublin Business School are required to use the APA referencing format in their assignments. This guide presents examples of how to reference textual sources. However if you use material from non-textual sources such as podcasts or documentaries you must also cite the source in full. For more information and examples, refer to Pears, R. and Shields, G. (2013) Cite them right: the essential referencing guide. (Note, that other, older versions of this book are available in the library too). Print version of this guide. Tomlinson, J. (1999). Globalisation and Culture. Cambridge: Polity Press. ...the impact of media messages can be seen in simple things such as how the weather forecast can influence the clothes people wear (Branston and Stafford, 2006, p. 273). Branston, G., & Stafford, R. (2006). The media student's book (4th ed.). London: Routledge. Share, P., Tovey, H., & Corcoran, M. P. (2007). A sociology of Ireland (3rd ed.). Dublin: Gill & Macmillan. ...to help his patients uncover these unconscious memories” (Robbins, Chatterjee, and Canda, 2010, p. 165). Robbins, S. P., Chatterjee, P., & Canda. E. R. (Eds.). (2010). Contemporary human behavior theory: A critical perspective for social work (2nd ed.). Upper Saddle River, NJ: Pearson. Leahy, A. L. (1998). Moving to a quality culture. In A. L. Leahy & M. M. Wiley (Eds. ), The Irish health system in the 21st century (pp. 105-113). Dublin: Oak Tree Press. Singer, P. (1986). Applied ethics. Oxford: Oxford University Press. ...as a standardised approach (American Psychological Association [APA], 2010, p. 17). ...to highlight the issue (APA, 2010, p. 182). American Psychological Association [APA] (2010). Publication manual of the American Psychological Association (6th ed.). Washington DC: Author. When the author and publisher are the same, use the word ‘Author’ as the name of the publisher. ...which was set out in the 1937 constitution of Ireland (Facts about Ireland, 2001, p. 36). Facts about Ireland. (2001). Dublin: Department of Foreign Affairs, Information Section. ...within the context of four broad theories” (Carr, 2001, p. 79). Use the name of the city in which the publisher is located in your reference. If there is more than one city listed (e.g. New York, London, etc.) use the nearest geographical place or the location of the publisher’s head office. If the town/city is not well known, you may add a county, region or state. Note, in the USA states are denoted by a two letter code, e.g. NJ = New Jersey. This and other bibliographic information, can be found on the back of the book's title page. Bornstein, E. (2009). The impulse of philanthropy. Cultural anthropology, 24(4), 622-651. Bristol, C.R. (2004). History of a Childhood Neurosis. Psychoanalytic Inquiry, 24(2), 286-308. Retrieved May 22, 2010, from PEP Archive. If a Digital Object Identifier (DOI) is available this should be used in place of the date & name of the database. e.g. van der Houwen, K., Stroebe, M., Stroebe, W., Schut, H., van den Bout, J., & Meij, L. (2010). Risk Factors for Bereavement Outcome: A Multivariate Approach. Death Studies, 34(3), 195-220. doi:10.1080/07481180903559196. It is worth nothing that “consciousness can be examined in a multitude of ways” (Conde, 2007). N. (2007). Nothingness. Consciousness, Literature & the Arts, 8(1). Retrieved May 1, 2010, from http://blackboard.lincoln.ac.uk/bbcswebdav/users/dmeyerdinkgrafe/archive/conde.html. ... which has been noted as a significant problem within Irish society (Morgan, 2010). Morgan, E. (2010, May 26). Struggling with literacy, numeracy and now, recession. The Irish Times. Retrieved 21 June, 2010, from http://www.irishtimes.com/newspaper/features/2010/0526/1224271139519.html. In-text Citation: (Freud, 1923/2001). In-text Citation: (Freud, 1923). Freud, S. (1923). The Ego and the Id. Standard Edition (Vol. 19). [Electronic version]. Retrieved from PEP Archive database. As the PEP Archive version splits the original work into sections, you should cite each section separately. Evaluating Websites: You should always ask the question ‘Is this website reliable?’ when using the internet for research. Check out the guide to ‘Evaluating Websites’ for further details.